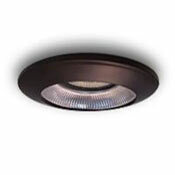 This innovative recessed downlight, with ribbed reflector and low profile trim ring is designed to accommodate a 12/24V low voltage MR16 bulb. This low voltage unit is supplied with an aluminum diecast housing. It mounts easily by means of side butterfly springs and relamps from the front by removing the face ring. The 1402 is ETL approved and conforms to UL standard 153. MAX. 35 watts.